The Douglas E. Goldman Jewish Genealogy Center has converted to digital format the late Dr. Meir Padoa’s collection of family trees. This collection, comprising hundreds of family trees documenting the history of Italian Jewry during the last centuries, now forms part of the database of the Genealogy Center and is available for searching by genealogists and historians. The digitization work was done by dedicated teams of volunteers working simultaneously at Beit Hatfutsot in Jerusalem and in the Galilee. Beit Hatfutsot wishes to thank the Padoa family for their kind assistance and readiness to register the Meir Padoa Collection with the database of the Douglas E. Goldman Jewish Genealogy Center. Israel Mario Meir Padoa was born in Florence, Italy during the week of Passover on Saturday, March 30, 1907. His parents, Gustavo Emmanuel Padoa and Clara nee Sacerdoti (Cohen), were an assimilated Jewish family whose origins can be traced back to the city of Modena. Mario changed his name to Meir following his immigration to the Land of Israel in 1930. Judaic traditions were not strong in his family. They had been affected by assimilationist trends that started 150 years before his birth. Meir’s father was opposed his and his brothers being circumcised. It was, however, only out of respect to the grandfather Camillo Sacerdoti, himself an assimilated Jew who still felt a commitment to his cohanic status, that the boys were brought into the Covenant of Abraham. Notwithstanding his weak Judaic heritage, Meir displayed since his early childhood an innate, instinctive belief in God. His faith was recognized by his relatives and his grandfather Camillo who used to say that “Mario should be a rabbi.” at the age of 18 Meir’s natural faith lead him, for the first time, to fast on Yom Kippur one year after his father passed away. Meir started his law studies in 1925 and earned a Ph.D. in Law in 1929. During his studies he continued to show a strong interest in Judaism following the guidance of Yehuda Menachem Alfonso Pacifici (1889-1981), a distinguished spiritual leader of the Italian Jewry. Pacifici was instrumental in bringing about a fundamental change in the way of life of many Italian Jews, especially among young descendants of illustrious families, who were detached from Judaism but showed a great willingness to learn. 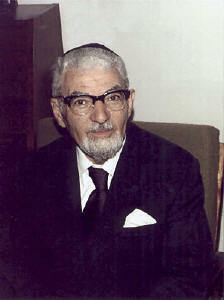 Pacifici’s opinions advocated a “complete Judaism” (“integral”, in his words), according to which “Zionism is a manifestation of Judaism.” Pacifici’s theories had a lasting influence on Meir’s worldview. After a long process, Meir became an observant Jew. At the time, he dedicated his efforts towards strengthening the Jewish identity of Jewish youngsters in Italy, particularly in Florence. With that aim in mind he encouraged others to attend the series of lectures at the Studi di Convegni Ebraici Institute delivered, among others, by Dr. Pacifici, Prof. Bonaventure, and the renowned Bible scholar Rabbi Moses David Cassuto. They both became, respectively, distinguished professors of psychology and biblical studies at the Hebrew University of Jerusalem. Meir’s activity during those years included organizing tours for Jewish youth on Sundays, coordinating conferences of the Italian Jewish youth, and taking steps on behalf the establishment of a Jewish high school in Florence. Meir’s Zionist activity started when he became responsible for small donations to Keren Kayemet in Toscana. He was in charge, at the time, of a Zionist club and eventually was nominated as chair of the Keren Kayemet in Florence. Meir initiated the creation of a fund in the memory of Rabbi Shmuel Zvi Margulies, who immigrated to Italy from Germany at the end of the 19th century and introduced to Italy the new Zionist ideas. The fund aspired at founding, in the Land of Israel, of a settlement in memory of Rabbi Margulies. The financial resources, though, did not suffice for the original goal, the money was finally donated to the Rudgas group, the first settlement of HaPoel HaMizrachi, that in time became Kvutzat Yavne. In Toscana, Meir established the first Zionist hachshara program in Italy. During the 1930s, Jews from Germany joined this hachshara, when Zionist activities were prohibited in Nazi Germany. In the spring of 1929, towards the conclusion of his university studies, Meir joined a group of friends who traveled to the Land of Israel for the Passover. He eventually made Aliya in September 1930, two weeks before Rosh Hashanah, after separating from his fiancיe whose parents opposed her immigration to the Land of Israel. On his way to Israel on board of Adriana, Meir met and befriended Abraham Herzfeld, a prominent leader of the Zionist Labor movement. Meir Padoa was among the first Italian Jews who immigrated to Israel. Upon his arrival at the port of Jaffa, Meir was welcome by Enzo Sereni. He had immigrated in 1927, was the first Italian halutz and one of the founders of Kibbutz Givat Brenner. Sereni tried persuading Meir to settle in Givat Brenner, but Meir knew that in kibbutz he could not continue the Jewish way of life he decided to follow and consequently settled in Tel Aviv. During his first year in Israel, he attended the Mikve Israel agricultural school as he tried to experience agricultural work and improve his command of Hebrew, which he started to learn while still in Italy. One year, however, was enough for him to understand that he was not suited for an agricultural career. At the end of 1931, he traveled back to Italy to keep the promise to his mother that he would visit her after one year in Israel. The visit continued for a number of months during which he visited Trieste, Milan, Turin, Rome, and other cities. Meir gave a series of lectures (Strada Faccendo) exhorting the Italian Jews to immigrate to Israel. During this tour, he started his connections with Banco di Roma, which then operated branches in Jerusalem, Jaffa, and Haifa. Once back in Israel Meir settled in Tel Aviv. He worked there six months for the Italian consul. In 1932, he moved to Jerusalem where he managed the local branch of Banco di Roma, located in the Old City, close to Jaffa Gate. After a few years, he became the director of the new branch that Banco di Roma opened in Zion Square. The bank was closed down by British mandate authorities subsequent to Italy’s entry into WW2. In June 1940, on the afternoon of Shavuot holiday, British police officers arrested Meir in his house. He was brought along with other Italian citizens to the Kishle prison near Jaffa Gate in the Old city of Jerusalem, where he was detained for one week until he could prove his loyalty to the British. In the summer of 1935, Meir married Felice, the daughter of Abraham Alberto Levi and Flora nee Basso of Trieste. When the bank was closed, Meir, who by then was father to two daughters, was without a job. Following his friend’s advice, he started working in the field of insurance. He continued his ties with Italian Jews after he settled in Israel, by conducting stimulating correspondence and guiding Italian visitors to Israel. His home in Jerusalem, where he lived following his marriage, became an open house for numerous guests. Meir was among the founders of the Italian synagogue established in Jerusalem in 1940. He was also one of the founders of the Italian Jews Association for Spiritual Activity (1941), served for many years as a member of its board, and left only when he understood that the association’s activities were not productive. In 1944, he learned of his mother’s death in Auschwitz, following her arrest in Italy by the Germans. During Israel’s War of Independence Meir was active in Netzach – a civilian defense organization. Before the establishment of the State of Israel, he was a member of the board of the Yeshuron synagogue, founded in 1929. During the 1950s, he was active in anti-missionary activities aimed at returning to Judaism, Jewish children brought up by Christians during the Holocaust. Following the establishment of the State of Israel, he joined the civil service, first in the Department for War Damages and then in the Ministry of Industry and Commerce in Jaffa. When the ministry moved to Jerusalem in 1950, Meir returned to the city along with his family. He worked with this ministry, at its headquarters in the Palace Building, until his retirement in the spring of 1972. He was in charge of editing the ministry’s various forms and authored the first guidelines booklet about this subject that was subsequently adopted by all government ministries. He later became a Hebrew language editor and eventually was appointed a Hebrew language-editing counselor. This position was, in his eyes, more like a fulfillment of a personal dream than as a professional achievement, since when he was still in Italy he eagerly looked forward to when he would have a prefect command of the Hebrew language. Following his retirement, he dedicated all his efforts in collecting information about the Jews of Italy – photographs of houses in Italy that once belonged to Jewish families and genealogical information about Jewish families, especially about the owners of those properties. This vast information eventually turned into the Meir Padoa Collection. Dr. Meir Padoa passed away on Shabbat, 18 Adar Beth 5763 (March 22, 2003). During his last days, he knew that new life has been given to his genealogical project. The family origin of Meir Padoa’s parents was in the city of Modena. During the 19th century, members of the Padoa family began to settle in other cities of Italy – in Venice, Padua, and in Florence towards the end of the century. His father’s family was among the first assimilated Jewish families in Italy. Meir’s paternal grandfather, Vittorio Padoa (1850-1904), was born in Modena, and his wife, Fany nee Tudeschi (1856-1944) came from the town of Bozzolo, near Mantua. Vittorio Padoa was a supervisor (inspector) with the Italian Railroads in charge of the main lines, including the southern network (IL meridionale). In 1900, a holy year in the Catholic calendar (L’anno santo), Vittorio Padoa received special recognition from the Pope for his efforts in securing high quality service of the railways. Because of his position, Vittorio moved from town to town; he started raising his family in Verona and by the end of the 19th century settled in Florence. The large family house was situated in the city center, close to the ghetto, at a time when Jews started leaving the Jewish quarter, but did not dare moving too far from it. It was in this house that Meir Padoa, his elder brother Vittorio and his younger brother Giorgio were born and grew up. Vittorio and Fany Padoa also owned a villa in the suburbs of Florence; this property was sold sometime later to the famous Italian tenor Enrico Carusso. Vittorio Padoa was an honorary consul of Puerto Rico and San Domingo. Meir Padoa’s maternal grandfathers were Camillo Gamliele Sacerdoti (1849-1933) and Pia nee Forti (1856-1944). Camillo Sacerdoti was an affluent person who did not need to work for a livelihood and dedicated all his time to his hobby of horse riding. He continued to ride even after he was seventy years of age; occasionally he was involved with selling and buying horses. In the family’s ancestral house in Modena there was a synagogue that Camillo Sacerdoti inherited from his grandfathers. When Meir Padoa’s grandfathers moved to Florence, the Torah scrolls and other objects from the family synagogue were moved to the Great Synagogue of Modena. Later Meir Padoa brought one of those Torah scrolls to Israel. Gustavo Emanuel Padoa, the father of Meir Padoa, studied medicine in Florence. He was a physician, had a private clinic, lectured on general pathology at the University of Florence, and managed the clinic of Poretta that used to be open annually during the summer season. Gustavo Emanuel was an erudite; he was active in the Italian cultural association Dante Aligheri. During 1910-1920, he was Deputy Mayor of Florence. Gustavo Emanuel was killed in a train accident on Yom Kippur, 1924 – honor guards of the Florence municipality in traditional uniforms attended his funeral. Following his retirement in the 1970s, Meir Padoa started collecting photographs and postcards of buildings in Italy that once belonged to Jews. The collection was organized according to families, cities, and provinces in Italy. As a result, he started to collect information about Italian Jewish families, including family trees. The visual collection is now over 37 albums with thousands of photographs classified by cities and provinces. There is also an alphabetical card index with the names of the property owners, a vast correspondence with individuals in Italy and other countries. The collection has an important historic and artistic value. The genealogical collection contains hundreds of family trees of Italian Jewish families, some of them going back to the 16th century. The genealogy of the Padoa family goes back to the 17th century. Some of the trees contain only names without dates. The trees have been sorted according to the various Italian provinces and by the alphabetical order of the family names. Meir stopped expanding his collection, when he was 92, since he felt that the work has been finished and the mission accomplished. In the summer of 2002, at the initiative of Mr. Ugo Luzzati, a connection was established between Meir Padoa and Beit Hatfutsot with the help of Padoa’s daughter, Mrs. Michal Padoa and the Douglas E. Goldman Jewish Genealogy Center at Beit Hatfutsot. Their aim was the converting the family tree collection into a digital format and integrating the data into the genealogical database of the museum. Meir knew about this initiative and the start of the important process of digitizing his collection of family trees by Mr. Ugo Luzzati, Mrs. Anita Kersenti, and his daughter, which meant a great deal to him.